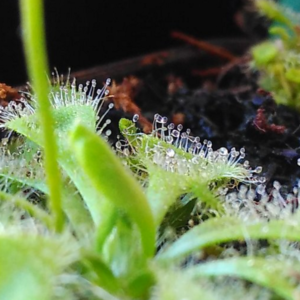 Drosera capensis, also known as the Cape Sundew, is a popular species of drosera from the Cape in South Africa. It has long leaves with dewy muciliage drops on tentacles. Insects are attracted to the drops of muciliage and stick to it once they come into contact. The tentacles, and if the insect is large enough, the whole leaf curl around the insect to maximize contact with the enzymes that then digest the insect to derive nutrition. 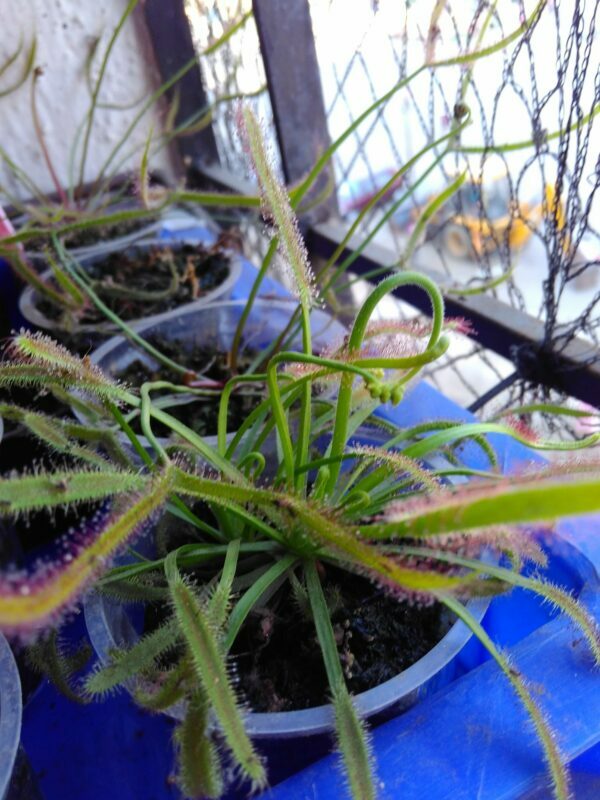 Drosera capensis x aliciae, is a hybrid of Drosera capensis and Drosera aliciae, often shortened to ‘Capiciae’. It has long leaves with dewy muciliage drops on tentacles. Insects are attracted to the drops of muciliage and stick to it once they come into contact. The tentacles, and if the insect is large enough, the whole leaf curl around the insect to maximize contact with the enzymes that then digest the insect to derive nutrition. The plant grows in a rosette that forms a stalk over time. If you can provide it the temperatures it prefers, it is rather easy to grow. 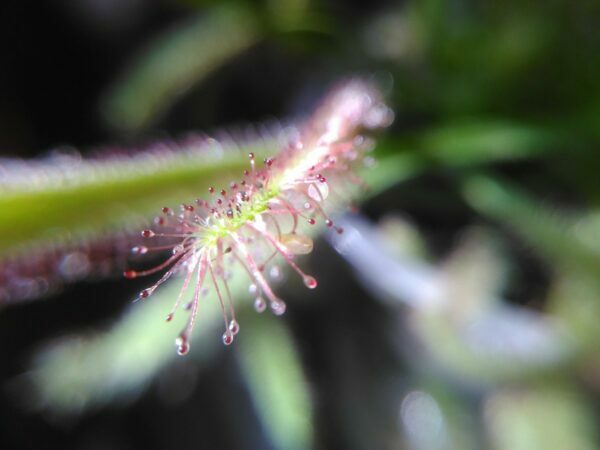 Media for Drosera ‘Capiciae’ should be nutrient poor and retain water well. 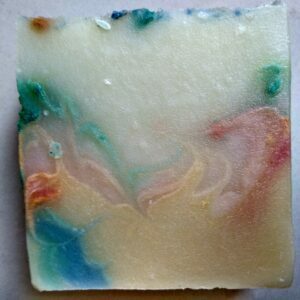 Sphagnum moss, cocopeat, peat are some options that work well. Rinse the potting mix thoroughly before planting. 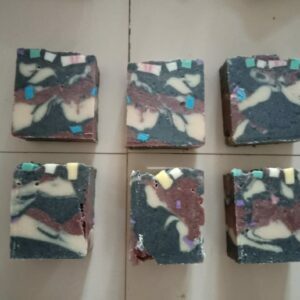 Particularly if you are using cocopeat, it is important to soak and drain it several times till water runs clear or very light in color. Cocopeat can have dissolved salts that will kill your plant. 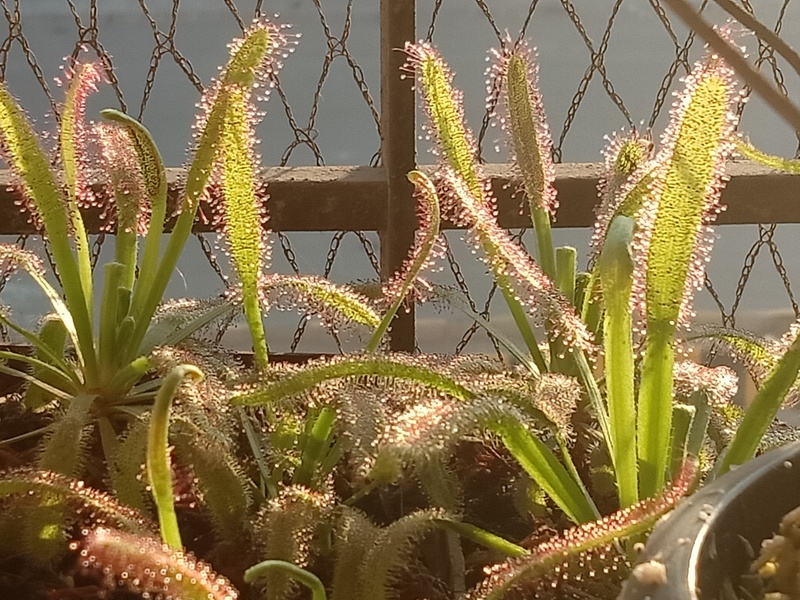 Drosera capensis x aliciae, like most drosera, enjoys bright sunlight. 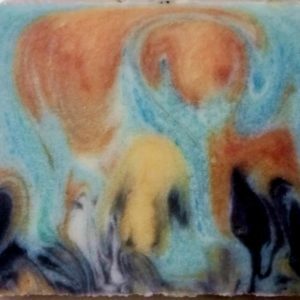 Direct light for several hours a day will help bring out colors. However, for growing in hot areas of India, care should be taken to see that the nights are cool. A location that receives bright light, but not direct sunlight may help in preventing the plant from overheating. A breezy location will also help keep the plant cool. On very hot summer days – temperatures above 35 degrees Celsius – it may be a good idea to water with cool water (not cold water) in the hottest part of the day. This plant grows well under growing lights too. 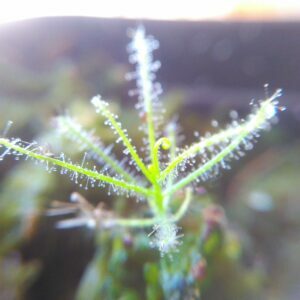 Drosera capensis x aliciae likes to stand in half an inch or so of water in my growing conditions. I have not faced any major problems other than temperatures (Mumbai summers can be HOT). In the event the leaves die back due to hot weather, I take it out of the water tray and keep it in a cool place (vegetable tray in fridge or an air conditioned room will work). I keep the potting mix damp, but not very wet. After a few months, new plantlets may emerge from the root. This will not always happen, but has happened a couple of times, if the roots were not damaged and the plant just died back due to heat. If you let the pot dry out in this period, of course the roots will die too. In very dry weather, the plant may stop forming dew. If increasing the light available to the plant is possible without risking heat damage, this is the better option. Bright light encourages dew formation. 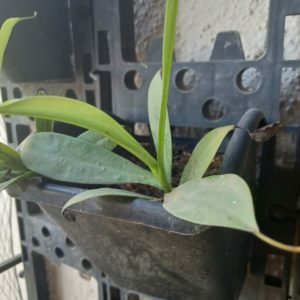 Alternatively, you can increase the humidity available to the plant by placing it among other plants growing in a water tray, surrounding it with a plastic cup with the bottom cut out or even putting it in a transparent bag. The last is the least preferred option, as giving 100% humidity may resume dew formation, but it will not help the plant adapt and it will have to be acclimatized to low humidity again, slowly. 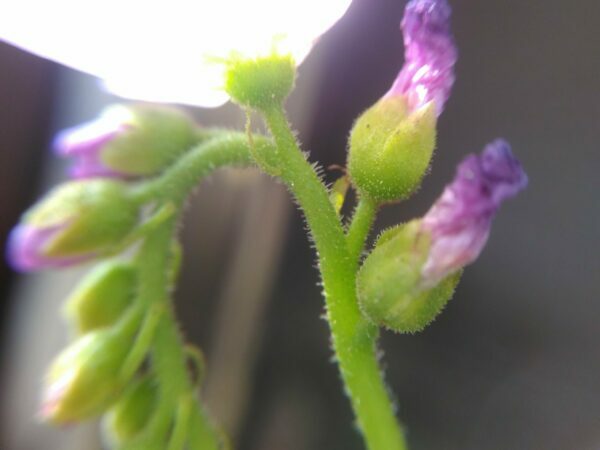 Once your plant is growing well, it will send up flower stalks. 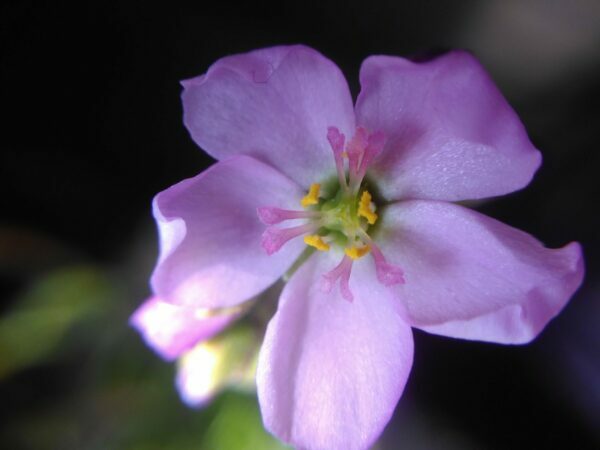 Flowers are self-fertile and set a lot of seeds to the point that if your growing conditions are good, you’ll find small plants popping up where you didn’t plant them because of seed falling into pots. Seeds can be planted on a similar medium as the plants. They can be sowed and transplanted after germination or sowed directly in the pots they are expected to grow in. Drosera capensis x aliciae isn’t too picky about disturbance and such as long as it gets good light, water and temperatures.Avoid transplanting during heat stress. Leaves can be cut and floated in distilled water or placed on damp media in good light and high humidity. Plantlets will grow from the leaves in a few months. Humidity must be high for this. 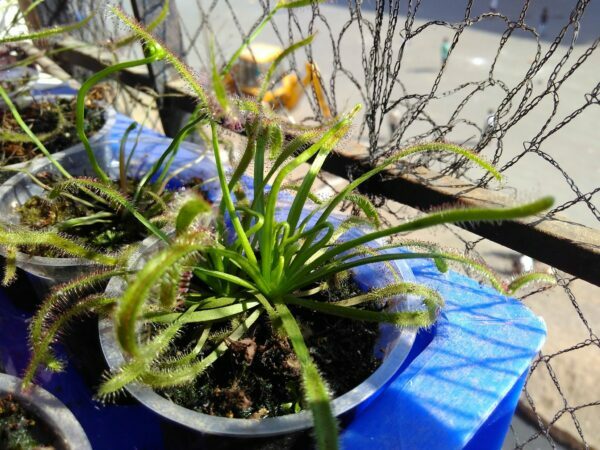 Drosera capensis x aliciae also has long roots and root cuttings can be used similarly. Sometimes a plant growing well will send up plantlets on its own. Once they are growing well, they can be separated into their own pots. If you have purchased seeds, you can sprinkle them on damp potting mix immediately or store them in a fridge (or at room temperature for a few months). Seeds lose viability over time, but this shouldn’t be too big a concern unless you store them for years. Even seeds stored at room temperature for years will have some germination in my experience. It is better to be prepared with the appropriate potting mix and arrangements to keep it damp (spray, cover or put in plastic bag or stand in a tray of water – DON’T top water or seeds will wash away) than to hurry to sow them. Seeds are very, very small. Please be careful when opening the packet. Ideally, switch off any fans and eliminate sources of breezes and keep a white paper underneath to spot any seeds that may fall. If you have purchased a plant, put it in suitable potting mix immediately. A plant losing leaves in shipping is normal and not a cause for concern. It will regrow new leaves once it settles. If there are any good leaves on the plant, it is better to put the plant in a transparent plastic bag or cover or otherwise provide very high humidity so that the leaves are not lost. If most of the leaves are lost, it is better to keep the plant open and mist a few times daily so that the new leaves that form are already acclimatized to your conditions. During this period, keep the plant in a bright but shaded location out of direct sunlight. Acclimatize to direct sunlight after it resumes active growth. This is it. Off the top of my head. If you have questions, please ask in comments. Do read extensively before growing carnivorous plants. This can be a learning curve.